Customers are served at a pop-up shop selling the Oh Henry! 4:25 chocolate bar in a photo provided by Hershey Canada. Undeterred by a ban on edibles in Canada’s initial rollout of legal recreational marijuana, food companies have found a way to cash in on the buzz by catering to post-consumption cravings with marijuana-free munchies. The country is gearing up for cannabis legalization for recreational use on Oct. 17, but edible products infused with pot will remain illegal until specific government regulations are rolled out in 2019 at the earliest. But some food firms have found an easier way to capitalize on cannabis by avoiding the plant altogether and focusing on the “munchies,” the side effect of increased hunger that marijuana can induce. Canada’s legalization of recreational pot – only the second country in the world to do so at a federal level – is a “huge cultural moment,” and Hershey Canada wanted to partake in the celebration, said Jackson Hitchon, the company’s senior director of marketing. “We felt that we didn’t want to be on the peripheral, we wanted to be part of the event,” said Hitchon. “It’s going to be a subtle hint, a wink at the 4-20 moment. The thought is that people in the culture, people in the know will get the reference,” Hitchon said. Cannabis-free products are not subject to the strict marketing rules governing the marijuana industry, which is essentially banned from advertising in Canada, with some exceptions. Cannabis firms are not able to use a blitz of flashy print, billboard or broadcast ads. Canada’s Bill C-45, which passed last month, sets out strict rules against promoting recreational cannabis and cannabis accessories – and any marketing towards young people is expressly prohibited. Non-pot companies have more freedom to reference cannabis culture in their marketing than the licensed producers themselves, said Brad Poulos, an instructor at Ryerson University’s Ted Rogers School of Management. “The government has no say over how companies advertise chocolate bars, but they do over how you advertise cannabis,” he said. Sensing the dawn of huge marketing opportunity without the complications that come with strict licensing of marijuana itself, other companies are also jumping on board the munchie wagon. B.C.-based 4:20 Grasshopper’s Gourmet launched in January, as a way to “play in the space” without actually getting into the cannabis sector, said Kenny Vannucci, its co-founder and owner. The company’s products include healthy trail mixes and snacks targeting the sudden spike in hunger – including one formulation called Sticks and Stoners. “We thought it would be kind of fun to just to potentially offer a little better munchie-snacking alternative, to anyone who was suffering from the munchies,” said Vannucci. Licensed medical marijuana producer MedReleaf sells a marijuana-flavoured, but drug free, chocolate-coated toffee called Cannabis Crunch under its AltaVie brand, in a bid to acquaint customers with their offerings ahead of edibles legislation. American fast-food chain Jack in the Box in January launched a limited edition late-night “Merry Munchie Meal” in select locations in California to commemorate the legalization of recreational cannabis in the state. The meal included two tacos, five mini churros and three chicken strips with a US$4.20 price tag. Jack in the Box partnered with Merry Jane, Snoop Dogg’s cannabis media platform, for the promotion. Food delivery service Foodora had a similar “Hot Box” promotion on April 20 in six Canadian cities, including Toronto, Montreal and Vancouver. Foodora partnered with seven restaurants such as The Grow Op in Toronto and Juke Fried Chicken in Vancouver and asked them to create a unique “over the top, munchie-style” dish, said Matt Rice, the company’s head of marketing. Each Hot Box came with a lighter, a box of mints, and a pair of sunglasses. Foodora is considering a similar promotion on 10/17, and beyond as well, but nothing is finalized yet, Rice added. However, many companies are focused on the bigger money opportunity in marijuana-infused edible products. Nearly 60 per cent of likely consumers of pot plan to purchase and use edibles, according to a recent Deloitte report, which pegged the value of Canada’s marijuana market at $7 billion. In California, consumers purchased US$180-million worth of cannabis-infused food and drink last year, amounting to roughly 10 per cent of the state’s total cannabis sales, according to Sylvain Charlebois, a professor in food distribution and policy at Dalhousie University in Halifax. The edibles market is poised to shake up Canada’s $200 billion food sector, he added in a report. 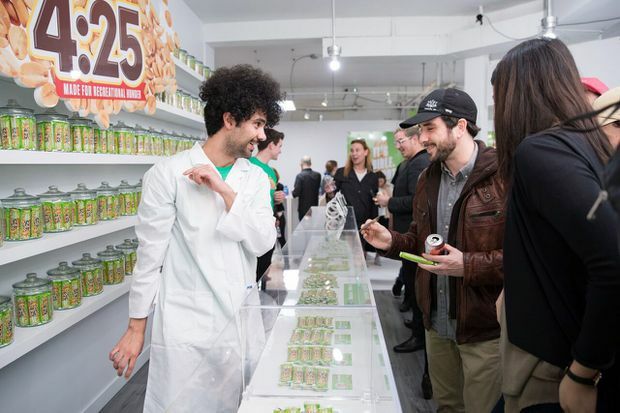 However, while companies like Foodora and Grasshopper said they are eyeing entry into the edibles market, others are uncertain about how an association with marijuana will impact their brands, Charlebois said.